Everyone knows that being an "early bird' at a garage sale or thrift store can mean scooping up a great item. But you can't always be the first one on the scene at every garage sale or thrift store. In fact, it's impossible! But whether it's a yard sale or a thrift shop, you don't always have to be there first to score a great deal. On a few occasions, you might be able to make some dough on an item that's overlooked or ignored by other buyers. It's happened to me. Not long ago, I made some great money on an item that had been passed over for weeks by thrift store shoppers. This particular treasure was found at one of my favorite local thrift shops. I've scored some of incredible finds at this shop, including the previously touted $40 dollar embroidery machine that I flipped for a mind blowing three hundred dollars. Through some strange, magical thrift store karma, this small shop is often the source of my very best finds! I may start referring to the place as "The little shop that could." In this particular case, I spotted a big box containing an Ertl Farm House set. Ertl specializes in rural and farm related toys, including diecast farm equipment and farm scene sets. The set I found included a barn, windmills, farm house, barn animals and other odds and ends. For the record, I've never listed an Ertl toy on eBay that didn't sell! If you find Ertl stuff at a reasonable price, you'd be wise to buy it. Notice however, I said reasonable price? The main problem with this farm set is that it wasn't reasonably priced. The shop was asking a whopping forty dollars for the set! The problem is really with Dana, who's the manager of the shop. She has a tendency to research many donated items on eBay before pricing them for sale. More then once, Dana has run into her back office to check eBay after I asked her the price of an item. While I understand she doesn't want to just give stuff away, using eBay as a price comparison can sometimes be a little off-base. Basically there are thrift store prices...then there are eBay prices. Thrift shops are local...eBay is international! Do you expect to pay the same price for an item at a flea market as you do in the mall? Not hardly! Such was the case with the Ertl farm set. Dana probably found a similar set listed on eBay for $40 big ones and priced her set accordingly. So thanks to Dana's eBay comparison shopping, I had to take a pass on the overpriced Ertl set. Despite the high price, I figured that someone would quickly snap up the set for their kid or grandkid. But I was wrong. After a few days passed, I stopped by the shop and to my surprise the set was still there! It was clear the high price tag was scaring off buyers. Then another week went by with no sale...then another! After several weeks of being ignored by shoppers, Dana finally dropped the price of the set to twenty dollars. But still no sale! Finally I decided to make a move. After walking by the set for over three weeks, I went to Dana with an offer she couldn't refuse. Knowing that thrift shops have to make room for new donations coming in everyday, I appealed to Dana's business sense. I pointed out the set had been in the shop for a long time. I then generously offered ten dollars for the set, adding this would free up some much needed space on her shelves. Apparently this hit home with Dana...she took my ten dollar bill and I took the set home! You can't lose with Ertl toys! When I arrived home, I asked my son to re-assemble the set on his Ikea desk. If you have teenagers you might be able to guess how that turned out! He got about half way through the job then quickly lost interest. Old Dad had to finish the job, fixing those pieces he haphazardly slapped together and adding more parts to each building he conveniently ignored. Sheesh....kids! But on a positive note, Sonny Boy's big Ikea desk was perfect for spreading out all the buildings and farm figures. Once assembled, I took some photos and posted the set on eBay. The auction proved once again that you can never go wrong selling Ertl. The farm set that went unloved and ignored in the thrift shop, sold for an impressive $44 dollars on eBay! I am still amazed by that. Literally hundreds of people walked by that set for weeks at the thrift store and yet no one bought it. I took it home and flipped it for over forty dollars. I guess the magic continues at my favorite thrift shop! Wheww! Summer has arrived and it's hot and muggy in my part of the garage sale world. It's the kind of heat that makes you want to wrap up early on Saturday mornings, head home and crank up the air conditioner! Being both a keen weather observer as well as a garage sale picker, I've noticed the summer mornings always start off cool and comfortable, but quickly degenerate into a sauna after the nine o'clock hour. This can cause the late morning sales to turn into a high-intensity workout! Making matters even worse, some of the high-highfalutin neighborhoods I frequent have super long driveways. On those rare occasions when I end up empty-handed, it can be a looong, muggy walk back to the old truckster! It all proves once again that going to garage sales is not for the faint of heart...especially in the summertime! But despite the heat, one of those long driveways turned out to be worth the hike last summer. At that particular sale I bought something most of my competition usually overlook....Polaroid instant film. You may be wondering whether they still make Polaroid film? Well, yes and no. But before we get into all that, let's take a stroll down memory lane. For those of you not born in the stone age like me, the Polaroid camera and it's instant film were a very big deal back in the day. Prior to Polaroid, most people used Kodak film and cameras. Kodak film was the complete opposite of instant, requiring you to not only transport your roll of film to a developer, but also wait days or weeks before getting your pictures back! Supermarkets, department stores and camera shops were some of your choices when having film developed. You could also choose to mail your film away to some distant developer, waiting weeks before receiving your photographs back. It was a real pain! But with Polaroid cameras you didn't have to go through all that hassle. Just snap a photo and the picture developed right in front of your eyes. It was convenient and amazing! cameras. Digital cameras required no film-just download and edit your photographs right on your home computer! 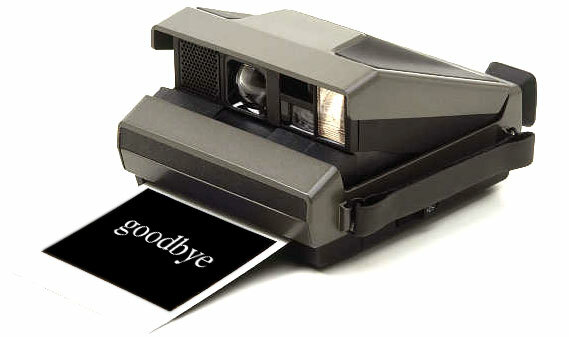 As digital cameras began to grow in popularity, Polaroid cameras began to fade away. The mass exodus away from Polaroid can be seen at your local thrift store. On any given day you'll probably find one of two Polaroid cameras on the thrift store shelves. While most are not worth a hill of beans, a few of the cameras still sell for big money. I'll get to that in a later blog. Polaroid:If you see it-buy it! it. The demand was such that a company in Europe stepped in to fill the need. The company currently produces an instant film for old Polaroid cameras, selling an eight-picture pack for a hefty $21 bucks. But even with new film being produced, Polaroid aficionados still clamor for the original Polaroid film in the blue boxes. 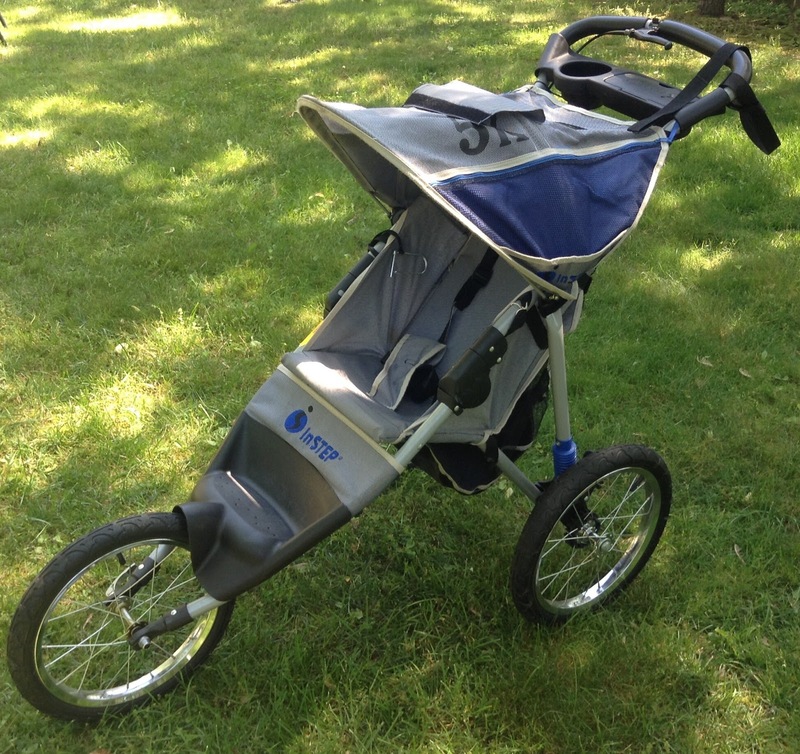 This makes it a hot item to look for at garage sales! I occasionally get lucky and find a few boxes here and there. Case in point: the seven boxes seen here were snagged for the incredible price of just three dollars. The seller priced it low probably thinking Polaroid film is worthless. But boy was he ever wrong. A few weeks later I sold the entire lot on eBay for $268 dollars! Pretty good for old expired film, right? Speaking of which, if you score Polaroid film don't be discouraged if it has an old expiration date on the box. Polaroid buffs don't seem to care about that. The film I sold was over eight years old. I made sure to mention the expiration date in the item description. By doing so, I avoided any misunderstandings or possible complaints regarding the age of the film. But considering I made almost $300 dollars on the flip, it was obvious the expiration date was not a big deal to bidders. Be sure to add Polaroid film to your garage sale "buy" list. While it's becoming harder and harder to find, it's still out there and will make you big money! Would Yoda from Star Wars like the Cracker Barrel menu ? This is how it's suppose to work. A few weekends ago, I made two fast deals and turned a twenty dollar bill into $90 dollars. It was the perfect combination of a little hustle and a lucky break that keeps me plugging away at the thrift stores and yard sales. The deal had it's origins back in the fall of last year. I found a life-size rubber Yoda at a sale for only twenty bucks. The little guy was just under three feet high and wearing his Jedi knight robe. However with several cracks in his face, he looked like he'd lost a fight to the evil Darth Vader! But despite his rough appearance, I knew there were plenty of rabid Star Wars fans who would love to add this Yoda to their collection. So I handed the seller twenty dollars and transported Yoda home in my Millennium truckster! there could be a crazy collector willing to overlook Yoda's flaws and see his inner beauty! Sad to say though, the Force was not with Yoda. Oh sure, I received a few e-mails. Mostly from wise guys who wanted to know if I'd gotten the license plate number of the truck that hit poor Yoda? Hardee-har-har! Those Star Wars collectors are a so darn funny...not! So due to underwhelming interest, I slowly dropped the price of Yoda over several months. Finally I hit the magic dollar mark of $40, causing a toy collector to contact me. He offered a disappointing $35 bucks for Yoda. Although only a $15 profit, I decided it was time for the little guy to move on. The buyer was over an hour's drive away, so I told him I'd meet him just off the Interstate. Although this saved the toy collector a good half hour drive, I didn't do it solely because I am a super nice guy. I chose this particular exit because it was was only five minutes from one of my favorite Goodwill stores. You have to make things work for you sometimes! After handing off Yoda, my plan was I to head over to the Goodwill store...a good call as it later turned out! Mr. Toy Collector pulled off the exit and met me at a nearby gas station. I grabbedYoda from the back of the truck and handed him to his new owner. As I did, the toy collector let out a sympathetic "Awww" as if I'd given him an injured puppy! 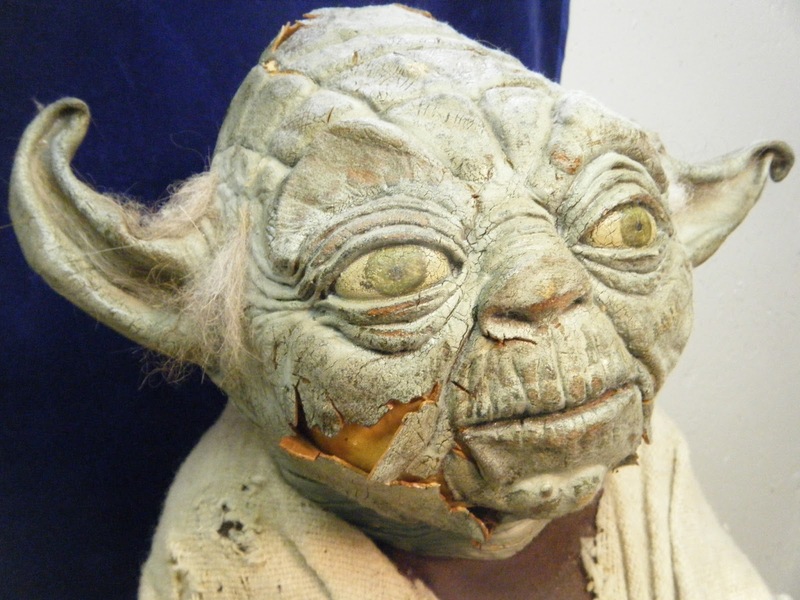 Looking over Yoda's cracked face, the Toy Collector told me that he also repaired toys. Like a Hollywood plastic surgeon, he confidently declared he'd make Yoda look as good as new! More importantly, even though we agreed on $35, he handed me two twenty dollar bills and told me me to keep the extra five as a delivery charge. After shaking hands and parting ways, I was pretty pleased with doubling my money on Yoda! At Goodwill: a brand new rocker! of furniture that stood out like like a gem in a junk yard....a brand new oak rocking chair! This wasn't just any rocking chair though...it was a "Cracker Barrel" rocker. If you've been to the restaurant, you know what I mean. They're well-built, sturdy rockers sold on the "front porch" of every Cracker Barrel restaurant. It's easy to identify a Cracker Barrel rocker. In addition to their well-built construction, they have a metal Cracker Barrel emblem inset on the back of the chair. I was shocked I'd found this quality rocker sitting in Goodwill! My guess was that it just got placed out on the floor shortly before I waltzed in the front door. I also didn't have to look hard for the price. The rocker had about a gazillion price stickers, all of which read $30 dollars! Since Cracker Barrel sells the same rocker at their restaurants for over $100 bucks I knew this was a fantastic deal! Still trying to convince myself it was too good to be true, I examined the rocker searching for a cracked spindle, a missing piece, a large gouge...anything to explain why it was in the thrift store? After a thorough going over, including me rocking in the chair then getting back up, then sitting back down to rock some more, I came to a conclusion. Not only was the rocker in perfect shape...it was brand new too! Grabbing the chair, I paid for it using $30 dollars from my Yoda deal! Out in the sun & ready for resale! Arriving home on a beautiful Saturday afternoon, I pulled the rocker out of the truck and went right to work. I carefully peeled off the stickers the over zealous GW employee had plastered all over the rocker. But I decided to leave the remnants of an original plastic cord still looped around one of the spindles. In my view, this fresh looking cord proved the rocker was brand new. After taking photos of the rocker, I also did a little "Re-Con" work. I telephoned my local Cracker Barrel restaurant inquiring how much they wanted for their rockers? The kid answering the phone told me their rockers were priced at $140 dollars! Being a thorough researcher, I decided to also double check on their website. Sure enough, the exact rocker sells for $139 on-line! 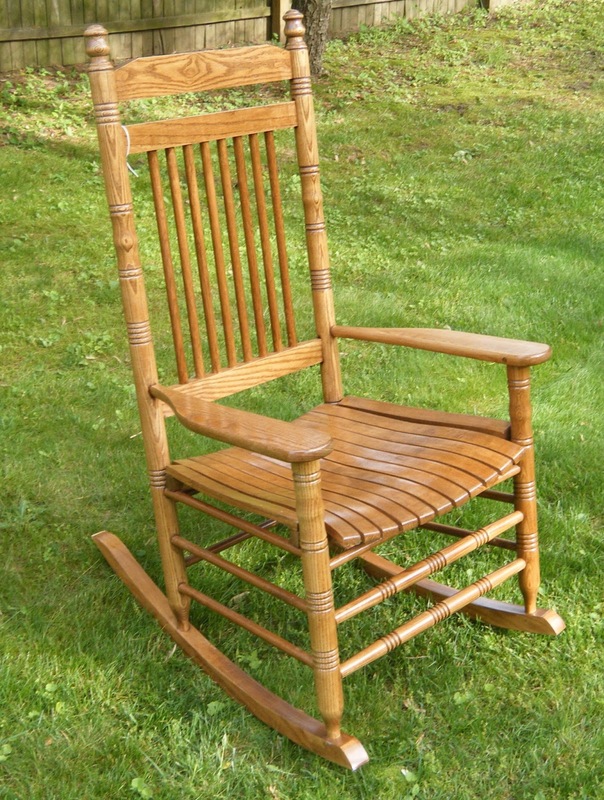 Not wanting to waste any further time, I posted the Cracker Barrel Rocker on Craigslist that night. But even after posting the ad, I still wrestled with the idea of keeping the comfortable rocker for myself. During the evening I plopped into the chair and rocked back and forth, admiring it's glossy finish and gorgeous oak grain. If not for the fact that I already have one L.L. Bean rocker and believe it or not, two Cracker Barrel rockers on my front porch, my Goodwill rocker probably would have been a keeper! But the following day put an end to any more "should I or shouldn't ?" speculation. A nice lady e-mailed saying she wanted to buy the rocker for her husband. She also asked me if I would I would take less for it? Working on the theory that pigs get fat, while hogs get slaughtered, I told her I'd settle for $90. She drove right over, handed me $90 bucks and left with her new Cracker Barrel rocker. To console myself on the loss of the beautiful rocker, I sat in one of my three other rockers and counted my money! Amazingly, the total time elapsed in turning $20 bucks into $90 was just over 24 hours. As I said in the beginning...that's how it's suppose to work! Makes you want to head right down to the Goodwill store doesn't it? Me too...I'll meet you there! Tell us about your "fast flip" in the comment section below!